We all occasionally struggle when it comes to building habits. You read about an exciting way to improve your life, but then after doing it for a few days you quickly realize that it’s a lot harder than you originally thought. What usually happens then is you quit in frustration because you simply can’t maintain this new habit. 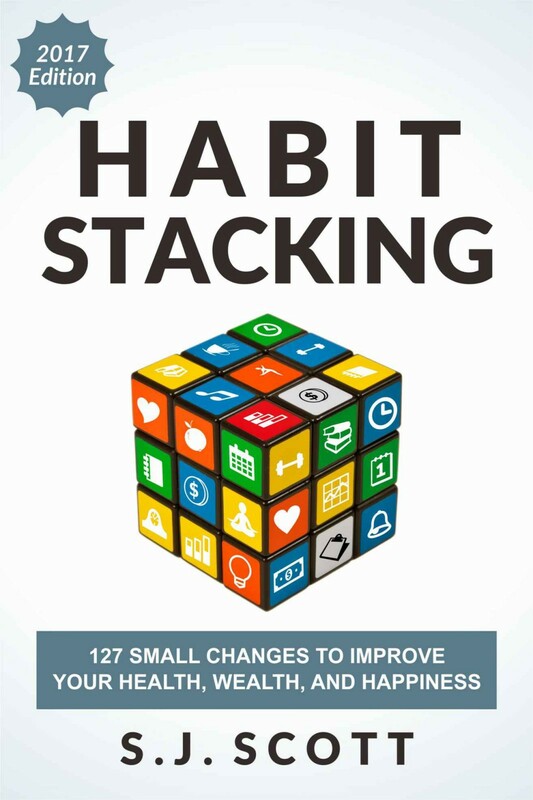 As you start to incorporate habit stacking into your life, you will experience the occasional challenge. That’s why I recommend reading this section at least once, and then bookmarking it as a reference for those times when you struggle with your routines. You have a stack scheduled and you have the checklist in front of you, but you simply don’t feel motivated to get started. In fact, you can think of a few dozen other things you’d rather do than complete this routine. Trust me, you’re not alone here. Many people struggle with their habits. This is true even for the permanent routines that you’ve completed a thousand times before. As I’ve mentioned before, I try to run a marathon twice a year, which means I must do a lot of running each week—usually in a variety of environments that are not particularly pleasant. Sometimes it’s too hot. Or cold. Or rainy. Or dark. Or boring (if I have to run on a treadmill at the gym). What usually happens is, after I get to the second mile, I’ll feel energized enough to run a few more, and usually this is enough to get me through the workout. You can apply creative lying to your habit stacking routine whenever you feel a lack of motivation. In fact, I recommend a simple solution that you can apply to any hard-to-start routine. It’s called mini habits, which I mentioned in a previous section. The purpose of mini habits is to remove the resistance that you feel when it comes to starting a difficult (or time-consuming) task. It’s easy to schedule an activity into your day (like running for an hour), but it’s hard to complete when you feel a lack of interest. Mini habits work because they eliminate motivation from the equation. Instead of setting an extremely challenging goal, you set a “lowball” goal that makes it super simple to get started. Imagine you set a goal to exercise for thirty minutes. Everything goes perfectly the first week. You join a gym, attend a few classes, and enjoy the endorphin rush of frequent exercise. One day, your boss asks you to work late, so you’re forced to skip your scheduled class. You tell yourself, “That’s okay, I’ll do it tomorrow.” But in the back of your mind, you start to doubt your commitment to this new exercise habit. This pattern repeats itself over the next few weeks. You miss classes for a variety of reasons: Your kid has the flu. You didn’t pack your gym clothes. The roads are covered in snow. You have to wash your cat. Suddenly, this “thirty minutes of exercise time” has turned into a task that feels impossible to do consistently. Stinks, doesn’t it? The mini habit concept prevents this scenario because it eliminates that overwhelmed feeling you get when you think a task is too difficult to complete. When people try to change, they usually try to get amped up for the change, but no matter how badly you want the change, you haven’t changed yet! As motivation wanes, so does progress. You don’t need more motivation, you need a strategy that can leverage the abilities of the current you into a better you. In other words, the simplest, most effective way to create a lasting change is to create a goal that might seem too easy to complete but is also so easy that you can do it on a consistent basis. Stephen discovered the concept of mini habits through something he calls his “One Push-up Challenge.” For a long time, he relied too much on willpower and motivation to get inspired to exercise. Then, one day, he decided to set a very easy goal—commit to completing one single push-up. If he wanted to do more, then he would, but the most important thing was to set a goal that was incredibly simple to achieve. The number of push-ups is irrelevant. What was crucial was the fact that he was building a habit. No matter what happened during the day, he completed the push-up goal for that day. Daily exercise in small amounts is far more powerful than single, intense workout sessions. The former can become habit and destroy your resistance over time, while the latter makes you really sore for a few days and that’s about it. When my resistance to exercise had been whittled down, I began my current streak of going to the gym 3–6x a week. I haven’t looked back. 1. Your success will lead to more success. It’s easy to get discouraged when you fail repeatedly. On the other hand, a mini habit will create a sense of excitement because you’re achieving an important daily goal. Trust me—when you have a thirty-day streak going, it’s easier to feel that excitement to get started each day. 2. You will avoid the guilt trip. It’s fun to have a streak of consecutive days where you work at something new. This is the exact opposite of what happens when you miss a day or two. There is nothing to be gained by setting an overly ambitious goal. All this does is create a negative attitude toward an activity that’s supposed to be fun. 3. You increase the desire to build the habit. It’s easy to procrastinate when you know that every day you “must” spend hours on a task. In fact, you’ll quickly learn to dread this activity. But by setting an achievable goal, you push past that inertia and get started because the goal seems completely doable. 4. You’ll do more than planned. A strange thing happens once you overcome your initial inertia and get started. What usually happens is you convince yourself to keep going and do way more than you’d planned. You’re using the power of self-deception to trick yourself into getting started. This creates enough momentum that you’ll keep going long after you’ve passed the daily goal. 5. You’ll form a habit. Consistency is more important for building habits than hitting a specific metric. At first, an external cue will trigger your routine, like an alarm on your phone. But eventually, you’ll simply remember to work at your skill at a specific time each day. This is what happens when you build a positive habit into your life. I recommend creating a mini habit where you can complete your stacks no matter what comes up in your life. Since most people get tripped up by the amount of effort required to complete this routine, you should make the commitment as brain-dead-simple as possible to get started. I recognize that these tips seem counterintuitive to the rules described in Part IV. But sometimes, when you’re feeling a lack of motivation, you need an extra push to spur you into action. Creating a mini habits goal can be that push. It will prevent those times when you’ll skip a routine because you think it’s too overwhelming. Sure, there will be days when you can’t complete a full stack. But what’s important (as you’ve heard me mention already) is to stay consistent with doing something every single day. Sometimes you feel like you’re too busy to squeeze in time for a new habit. This can be especially true if you schedule it in the evening, after you’ve already had a busy, stressful day. I’m not going to lie and say it’s always easy to carve out a spare thirty minutes, but there are two strategies you can use to “find” more time. Right now, there are probably a few activities that can be streamlined or even eliminated from your schedule. Perhaps you could skip a half hour of TV time. Or find a creative way to skip that low-value meeting that isn’t important for your job. Or maybe you could bring a bag lunch to work, eat at your desk, and complete a stack during your lunch break. My point is simple: you probably waste more time than you think. The obvious culprit is media consumption. It has been reported that the average US citizen spends eight hours daily consuming media, including watching television and surfing the Internet. If you do both activities, that’s a quarter of your day spent doing nothing. If you can sacrifice just an hour of this time, that’s one more hour than most people spend on their goals. If you want to build a positive habit stacking routine, then it’s worth getting up earlier in the morning when there are fewer distractions. Now, this doesn’t have to mean you’ll lose sleep. In fact, if you go to bed thirty minutes earlier at night (maybe by skipping one TV show), then you’ll feel just as rested when you get up in the morning. Just do the math: 30 minutes each day is an extra 210 minutes (or 3 hours 40 minutes) each week. Over a year’s time, that’s 182.5 hours that can be dedicated to deliberate practice. I guarantee this small change will give you enough time to have an amazing impact. Don’t make the excuse that you don’t have enough time to work on a positive habit. If you have enough time to goof off and consume hours of media, then you absolutely have time to work on your personal development. Sometimes “life” will intrude upon your attempts at personal development. Okay, who am I kidding? Not sometimes—nearly all of the time. You probably feel that it’s nearly impossible to make any plan without it getting disrupted. These distractions often seem relentless, especially the moment you decide to work on self-improvement. Here’s the thing: No one can build positive habits in a vacuum, free from responsibilities and disruptions. It’s not like everyone in your life will suddenly need less from you the moment you decide to work on yourself. But, if you are smart about how you structure your day, and if you maintain open communication with others, it’s not that hard to manage these potential disruptions. 1. Wake up before anyone else and complete the routine first thing in the morning. Most people won’t be up, so this virtually eliminates all potential people distractions. 2. Understand your bad triggers, which cause you to procrastinate or make you feel unmotivated. Keeping track of your negative habits will help you identify those moments of weaknesses when you are likely to skip the routine. 3. Create an “if-then plan” related to your biggest distractions. For instance, if you know your husband often interrupts your routine, then create a strategy of how to prevent or deal with the situation. 4. Complete the routine in a part of your home that family members don’t typically use (like your basement). 5. Avoid all forms of technology in the 15 minutes before the routine (i.e., cell phone, laptop, and TV), because this will remove the temptation to goof off or focus on work projects. 6. Make a promise that you’ll “treat yourself” to a reward right after you complete a stack. 7. Schedule this habit into your day like an appointment. Let friends, family, and coworkers know that this is a sacred time that shouldn’t be interrupted unless it’s an emergency. None of these strategies work 100% of the time. But if you proactively address your distractions on a continual basis, you’ll find that it’s not hard to slowly eliminate them from your life. I’ll admit it: Sometimes habit stacking can feel like a grind. You wake up in the morning, knowing you have dozens of tasks or errands to complete, so the last thing you want to do is to “waste time” on an activity that doesn’t have a positive, immediate benefit. That said, if you constantly dread this activity or feel like it’s a big waste of your time, then I suggest that you examine the “why” behind your desire to complete this routine. Odds are, a negative feeling is the result of not aligning each habit with one of your goals. Here’s a brief story that best illustrates the importance of knowing and sticking to your priorities. This was first shared by Scott Dinsmore on his Live Your Legend site. Here he talked about meeting a friend of Warren Buffett’s pilot (whom he calls Steve). In this conversation, Steve talked about how Buffett encouraged him to write down a list of twenty-five things he wanted to do over the next few years. After completing this list, Buffett told him to review this list and circle his top five priorities. These goals would be more important than anything else in Steve’s life. Next, Steve was encouraged to create an action plan for these five activities. Buffett encouraged him to write them down as actionable goals and then get started on them immediately. Especially since it comes from one of the wealthiest people in the world. The lesson here is that while we live in an amazing world full of opportunities, it’s risky to try to do it all. If you’re trying to balance a dozen projects and obligations, then you’ll make very little progress with any one of them. • Write down a list of twenty-five priorities that you want to accomplish in the next few years. • Identify the top five that are important right now. • Identify the other twenty that might be a distraction from your five priorities. Make a mental commitment to avoid these activities at all costs. • If you feel disinterested in a stacking routine, then closely examine each of the habits. If you don’t have a clear reason why an action is important, then get rid of it! We all feel the occasional lack of desire. Often, you might think there are better things to do with your time. But if each habit directly relates to a major goal, then all you need to do is remind yourself why you’ve chosen to complete these daily actions. People often procrastinate (or avoid) a habit when there is no immediate negative consequence. Sure, you know it’s important to improve your health, finances, and relationships, but these often don’t seem as urgent as the next coming project. I feel this challenge is the direct result of nobody holding you accountable for skipping this routine. Fortunately, it’s not hard to overcome this challenge. All you need to do is work with an accountability partner. An accountability partnership is an arrangement where two (or more) people mutually agree to support one another in the achievement of a specific goal. The two of you should have daily or weekly feedback sessions to share wins and talk about your current challenges. In regard to habit stacking, your partner will keep you on track to make sure you don’t skip this routine. And when you do, it’s up to this person to help you make sure you don’t miss another one. This feedback can be given in a friendly manner, but the point of accountability is to make sure both people follow through with their commitments. If working with an accountability partner sounds like something you want to do, then you should understand both the advantages and disadvantages of this arrangement. • You have an opportunity to coach someone while also receiving value in return. • You get a very direct form of accountability. Habit-building apps are impersonal, but forming a partnership with someone can lead to a strong friendship as you share your hopes, struggles, dreams, and goals with each other. • You connect at a mutually convenient time. There are no appointments like you would have with a professional coach. • Accountability partnerships are usually free. • You won’t always be compatible with the person you pick. If you clash with your accountability partner, you are likely to have arguments or major disagreements. This can be a discouraging experience, or even become a major obstacle that gets in the way of your goals. • This type of relationship is difficult to maintain if you are both busy and don’t have similar schedules. • If one accountability partner is at a higher level than the other, the coaching can be very one-sided. • It’s not as formal as other types of accountability, which can be a distraction if you have a results-driven personality. Working with an accountability partner is a great option if you need constant feedback on your goals. If you’re interested in finding someone to partner with, then I recommend joining our habits-focused Facebook Group and asking around for an accountability partner there: http://www.HabitsGroup.com. It’s easy to fall off the habit wagon. You’re consistent for a few weeks, but then your schedule is thrown into disarray because of a vacation, emergency, or holiday (like Thanksgiving or Christmas). Next thing you know, this small hiccup has turned into a streak of missed days. Even worse, you play the “blame game,” where you use negative self-talk and get mad at yourself because you can’t stick with a new habit. Trust me: the scenario I just described happens to all of us. Fortunately, there are two simple strategies you can use to reignite your dedication to a habit stack. First, you need to forgive yourself. Understand that everyone slips up from time to time and nobody is 100% perfect with their habits. Beating yourself up for missing a few days, or even a week, accomplishes nothing. My advice: take responsibility for slipping up, but also forgive yourself. Honestly, it’s not the end of the world if you skip the occasional day. Next, “get back on the horse” by restarting your stack. The key here (as you probably guessed) is consistency. It’s better to have a streak of completed days than it is to complete a dozen habits one day, then skip the next day. Just focus on completing one to three small actions for a few days and then add more once the routine becomes a permanent behavior. Well, these are the six challenges that you might face when building a permanent routine. If you follow my advice, then you’ll discover it’s not hard to overcome the occasional obstacle that comes your way.